Super MB STAR is one of the best after-market tools for Benz diagnostic, coding/programming in the world. It covers Benz cars from 1989 and it can be updated in the end of customer side. No need to send it back or update through hard disk. It can do more cars than MB Star C3 and C4. 2. If you buy the software for all computers, please use it on the computer with COM Port, it is more stable than the connection by PCMCIA Card. NOTICE:This fix is for SUPER MB STAR C3 2018.03 Software ONLY!! Super MB STAR is one of the best after-market tools for Benz diagnostic, support coding and programming. Super MB Star also support directly update online, work with any laptops, compatible with Windows7/XP/VISTA/2000/Mac/Linux operation system, software including Xentry for new released C204/ C205/ CLA117/ GLC156/ E207/ E212, ect., which are able to work with Benz cars, trucks, Sprinters, Vans, Smart, Cobus, FUSO, BHARATBENZ, FOTON, etc. 5. New function of DATACARD is added. 7. Online updater client platform V2.0.0.1 for users'easier upgrade. 9. Start HHT Win from desktop icon directly, no need start from DAS. 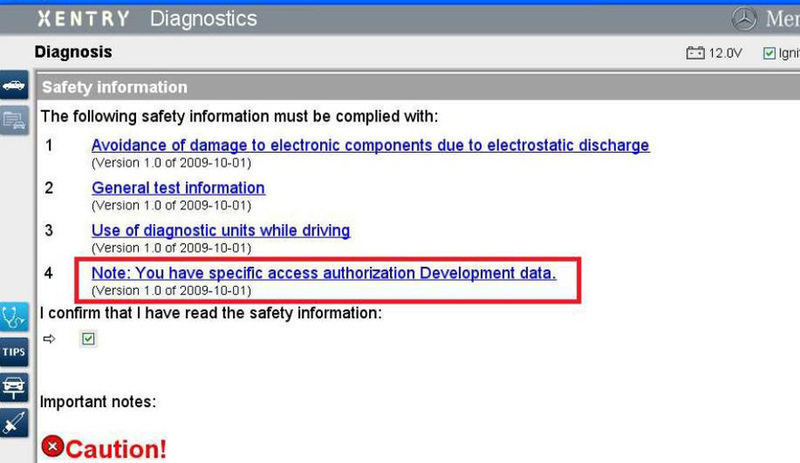 Xentry: New software released by Benz Company after 04/2009 by diagnosis newcars. Developer model: Mercedes-Benz engineer mode, remove limitations and open more Special functions. 1. 1989~up to now Car, Bus, Truck, Sprint, Smart . 5. Testing the component of cars:coding and programming. 1) Realizes all the function of official factory BENZ compact 3. 2) C3 Multiplexer can connect to factory computer and IBM laptop. 3) Complete maintenance data. It could offer full disassembly and assembly circuit diagram, working principle and element place anytime needed. It is the best assistant for maintenance man. Driver CD: Installation driver for PCMCIA or Express card. I use MB STAR (with DEV mode) for a couple of weeks. It's been really good so far and has been able to do a number of things so far. I've written this up after having done this using DAS Simulator. How to judge if your (Super MB STAR C3) USB Key is good or not? Download SUPER MB STAR USBKey Tester.exe, Insert the USB Key into the laptop, and then open the SUPER MB STAR USBKey Tester.exe,if this software can be opened successfully, it shows that your USB Key is good. How to set your xentry language? Q: How to activate the MB Star C3 software? A: After the installation in the VMware. There will be a file on the desktop named "How to setup your Star C3". Please read the file carefully. And provide us your ID for us to calculate the password. You can activate the software with this password. Q: How to update? How much does it charge? A: This device support update online. After one year for free, recharge in 24 hours from the beginning of renewals otherwise it will be useless. After 24 hours, if you do not upgrade, then you need to pay for it again. Q: How many years of free updating can we enjoy? A: Super MB STAR provides one year free update online service. Q: What else shall I do before using this item? A: You need setting some configurations before using this tool, we have both video and user manual to teach you how to do that, just follow the steps. Q: Super MB STAR is able to work with Trucks and change the speed limitation? A: Yes, Super MB STAR is able to work with different kinds of Benz trucks, and it is able to change the speed limitation, please do that under the legal permission. Q: What should I do if I do not know how to setting or face some difficulty when install the software? A: We provide online service 24 HRs, our after-sales service men can help you solve the problem through teamviewer, just contact the sales. Q: Is this tool able to work with Reset the Mercedes-Benz SBC Function? A: The Super MB STAR Top Version provides you SBC Reset, TV active and some other functions. Q: Hi sales, I only have a USB com computer, how can I do? A: Hello, sir,you can use the connection cable,C3 C4 Z-TEK USB1.1 To RS232 Convert Connector. Q: What is Super MB Star USB KEY used for? A: for Security USB Encryption. Q: How to correctly use Super MB Star USB KEY? A: Before start the Super MB Star software, insert into USB KEY, and when it runs, don’t take out USB KEY, otherwise the computer will automatically shutdown. Q: Does SUPER MB STAR contain developer mode? A: yes, our supplied super MB Star contains "developer mode" in the DAS. Q:Does Super MB Star is stored with Benz training and SD Media? A: Super MB Star is stored with SD Media but no Benz training. Q: What is Super MB Star password? 1). When the computer is in the sleep mode, the password is "User$star2004"
3). The password for decompressing update tool is "updatenow"
Q: the DELL D630 hard disk of Super MB Star installed locally or on a VMware? A: it doesn’t need to install on VMware player, only the moveable hard disk needs. Q: What the difference between super MB Star and MB Star C3 pro? A: They have different hardware and software, Super MB Star supports online update, while MB Star C3 doesn’t support online update. Q: How many years of free update? A: Super MB STAR provides one year free update online service. Super MB STAR Lite provides 3 months free update online service. Q: I tried to install Super MB Star on both Windows XP and Winds 7, but got the same error. 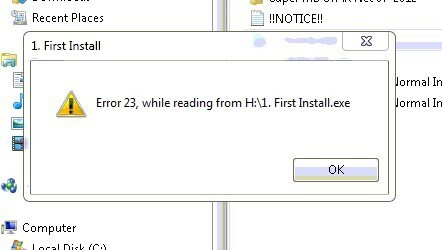 "First Install: Error 23, while reading from H:\1.First Install.exe"
A: Better setup and run the software on professional windows XP or WIN7. Note: super MB Star computer hardware and software requirements: Hardware requires at least Intel Celeron/Pentium 2.0GHz, 2G RAM, USB 2.0 recommended and Microsoft Windows 2000/XP/Vista/7 latest service pack installed. If it is not the reason of computer operation system, maybe the software was broken by the anti-virus software, if the Mercedes Benz Xentry software was broken, you have to return back to repair, if the broken software was not Xentry software, search in Google "VMware workstation" and download it. Q: How to active Super MB Star? 1) Refer to Super MB Star manual and video tutorial stored in the hard disk, or login and download from Super MB Star official website www.supermbstar.com. The user manual and video show you how to active Super MB Star. 2) We upload video in the “Video" column of Super MB Star page, it step-by-step shows how to active Super MB Star, if you can’t watch video in the Super MB Star page, just contact us. Note: the steps to active MB Star C3 / C4 is as similar as Super MB Star, except Star C3 / C4 need to active DAS, while super MB Star needn’t active DAS, before start the software insert into USB KEY, then you can directly enter super MB Star DAS without activation. Q: After enter Xentry, I got the error "No StarKey available". A: Please send us HW ID to help active. Q: Do we need to provide user ID and password when use Super MB Star to do online SCN coding? A: online SCN coding needs our engineer to authorize / active by remote assistant (TeamViewer). Q: How much money should I pay for SCN online coding per time? A: US$8900 (item No. SS99), after you pay it, contact us to active / authorize. Q: I bought one SUPER MB STAR C3 from you, can I use TIPS function? A: The TIPS function has nothing to do with the device software you use, it needs the original factory account to work. Q: I have one 1999 Mercedes and one piece of 38pin cable, please recommend me a tool which can reset the ECU an airbag? A: Recommend you use MB SD C4, Star C3 or C4. 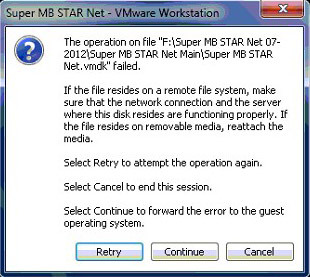 Q: When the hard disk version of super mb star c3 get the following error " The operation on file " F:\ Super MB STAR Net 07-2012\ Super MB STAR Net Main\ Super MB STAR Net.vmdk" failed. A: It indicates the software is broken, it needs to send us to reinstall the software.